My teacher said I learn by making mistakes. Since I didn’t make any today, I guess I didn’t learn anything. This story is followed by the notion that when people think they must do everything perfectly, they can spend energy blaming each other rather than finding a solution. It results in defensiveness and accusations rather than apologies and forgiveness. Mistake prevention gets in the way of daring and innovation. Most of us think that mistakes make us look stupid. For four decades Jamie McKenzie has been stressing the importance of engaging students in challenges that require original thought as they deal with new technology. This book takes on that challenge directly. It is designed to support teachers and leaders intent on raising a generation of thinkers capable of asking tough questions while generating good ideas. His insight and the resources in this book are ideal for staff development efforts and graduate courses. Click here to see my review of this book. Blink: The Power of Thinking Without Thinking is Malcolm Gladwell’s second bestseller. Even though it was written in 2005, the information remains current and valuable. This summary is written with educators in mind. His 3rd book, Outliers, is also available here. Click here to see my summary Blink. 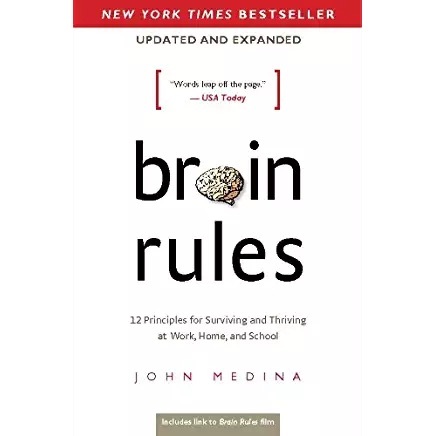 Brain Rules: 12 Principles for Surviving and Thriving at Work, Home, and School by John Medina tells how what we know about brain science can be used to positively influence our daily lives. This book is vital for educators, policy makers, and anyone who wants to get more out of their gray matter. Click at the bottom of any page to purchase this essential book. John is a developmental molecular biologist focused on the genes involved in human brain development and the genetics of psychiatric disorders. Most of his life has been spent working in the biotechnology and pharmaceutical industries. He teaches at Seattle Pacific University where he is the director of the Brain Center for Applied Learning Research. He also teaches in the bioengineering department at the University of Washington. His other books include Brain Rules for Baby, The Genetic Inferno, as well as books on Alzheimer’s, depression, and AIDS. The human brain is easily the most sophisticated information-transfer system on Earth. As you read this, it sends jolts of electricity crackling through hundreds of miles of microscopic wires in less time than it takes to blink. Brain scientists have a lot to learn, but they rarely have conversations with educators and business people. This book is meant to fill this communications void. Each of the 12 rules here are supported by research that has been replicated, and John focuses on how what we know can be applied to our daily lives. 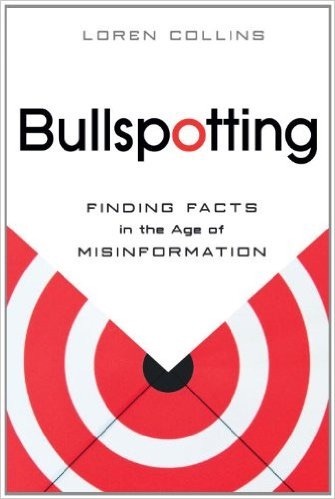 Bull Spotting: Finding Facts in the Age of Misinformation by Loren Collins will help you spot and avoid lies in a world with more accessible truth and lies than ever. In the age of fake news you can learn how to use the tools of critical thinking to identify the common features and trends of misinformation campaigns. Loren will help you tell the difference between real conspiracies and conspiracy theories, real science from pseudoscience, and history from fantasy. Loren is and attorney and firm associate with the Law Office of W. Bryant Greene, III, P. C. He is the creator of Barackryphal, a website that debunks the fallacies propounded by birthers regarding the birth and citizenship of President Obama. He has written for The Atlanta Journal-Constitution on the topics of misinformation and critical thinking. Operating in the world efficiently depends on one’s ability to identify crap, also known as misinformation. Today we are constantly bombarded with information, which makes crap detection more import than ever. We tend to rely on common sense, but recall that there was a time when common sense told our ancestors that the world was flat. It can be helpful, but we need to look to science to uncover the truth. Most of us are not conditioned to distinguish between good and bad sources. We favor information from sources we like and visa versa. We accept information that supports our beliefs, and doubt information that doesn’t. This is know as confirmation bias. Other biases include having our thinking impacted by how something is framed, and putting more weight on recent information. People evolved to spot patterns even when they don’t exist and to create stories, myths, to explain the patterns. The ancient Greeks, for example, created different Gods to explain how the world worked. A common feature of creative misinformation is the reliance of anomalies. The problem with this approach is that it doesn’t produce a cohesive alternative theory. The idea is that if you can undermine one detail of the consensus view you have disproved it. If you see this in action, it tends to be a good means of spotting misinformation. Occam’s razor tells us that the explanation that makes the fewest assumptions is most likely to be the correct one. Denialism concerns the rejection of truth accepted by experts. In some cases popular opinion denies scientific facts. For example, a 2010 poll showed that 40% of Americans believe humankind was created in our present form less than ten thousand years ago. The primary tactic is to look for anomalies that can poke holes in established theories. Deniers do not advance a cohesive alternative theory that can be tested. When confronted with evidence, deniers will often say it is forged or fake. When evidence can’t be denied they may say that it means something else like the Nazi gas chambers were not used for mass killings. Fake experts are also associated with deniers. While they may have college degrees, the degrees are usually in unrelated fields. Subjective experiences and anecdotes are often treated as solid evidence. Class Rank Weighs Down True Learning by Thomas R. Guskey – Phi Delta Kappan, March 2014, V95 N6, pp. 15-19. 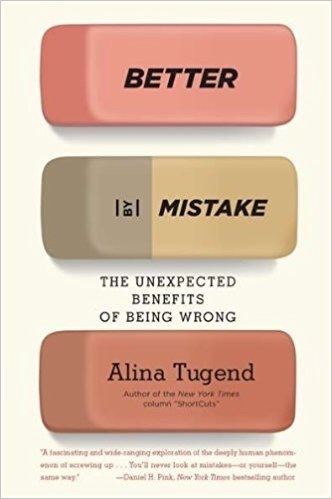 This is my summary of this fine article, which makes the point that teaching and grading schemes that work to select the most talented students often fail to benefit all students and to notice promising students. This may cause you to rethink what your high school is doing regarding this matter. Here is the link to the abstract. You will probably need a subscription if you want to view the full article, or you could hit your nearest college library. 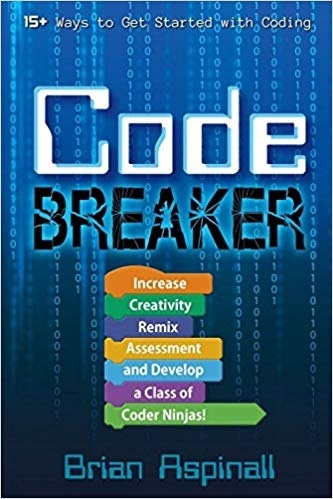 Code Breaker: Increase Creativity, Remix Assessment, and Develop a Class of Coder Ninjas! by Brian Aspinall shares his experiences and those of some colleagues in the process of teaching coding from kindergarten to high school. It deals with computational thinking which is a fundamental skill at the heart of engineering and mathematics. It includes coding and much more, and can even happen without technology. Make sure your school has a few copies. We live in an era of access as answers to knowledge-based questions can be quickly retrieved. As for coding, we have been teaching that in many forms since the 1960s. Like many, Brian is a self-taught coder. He offers ten reasons for teaching coding. They include building self-confidence, allowing students to create, self-expression, teaching storytelling, opportunities for risk-taking, reinforcing math principles, and teaching problem-solving. It is required for many future jobs, developing teamwork, and helping humanity. Brian tells of experiences as a computer club advisor where he saw students do some amazing things. The students tried, observed, tried again, failed, tried again, and at some point succeeded. This is what you don’t get in a lot of classrooms that focus on knowledge acquisition and worksheets. Like all chapters, this one has several QR codes that take you to pages of Brian’s blog. Here are the sites you get in this chapter. Hubbub! Coding a First Nations’ Game of Chance. Coding Probability Simulators with Python #CodeBreaker. Here you get a tutorial in the Python programming language. Ten Reasons Kids Should Learn to Code. Post the diagram and have your kids listen to the short [1:48] video. Here we get some learning theory. Assimilation happens when you incorporate new things into your current understanding. Accommodation happens when you learn new things and have to change what you currently understand. People learn best when they are involved in making or constructing things in the real world. To do this you need some control over your own learning. Learning should be concrete and computers are a good way to teach this. Computational thinking is a fundamental skill and it is at the heart of engineering and mathematics. What Is Computational Thinking? Computational Thinking can take on a variety of forms. 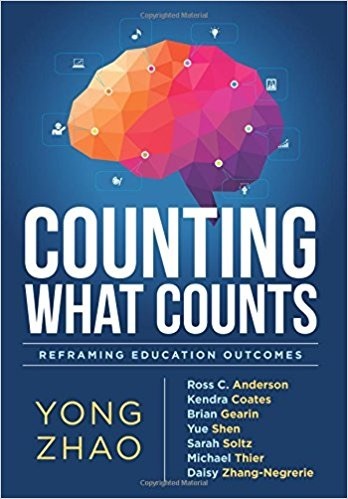 Counting What Counts: Reframing Education Outcomes by Yong Zhao and friends takes on the current system with its focus on standardized tests and their sole focus on cognitive skills. Chapters are devoted to defining a variety of non-cognitive skills that are connected with success in life and the current status of how to assess them. They make a case for a new paradigm that would move the system towards more personalized learning and assessment with more focus on non-cognitive skills. Be sure to add this fine book to your professional development library. Yong uses the story of how the natives of Easter Island overexploited the resources in a race to build ever bigger statues. He compares this to the current race to produce students with excellent tests scores. Here he makes the case that the obsession with test scores has and will continue to damage our education ecosystem. It has resulted in cheating, teaching to the test, focusing on students on the pass/fail border, and limiting the focus on subjects not tested. We are destroying teacher autonomy as we ignore real challenges like poverty, unsafe neighborhoods, and unequal access. We are striving to produce a homogeneous population rather than supporting diverse talents. Routine knowledge and skills are stressed and they can easily be outsourced or automated. There are many negative side effects that are not considered unlike drug companies that must evaluate and publish side effects of their products. Creativity and non-cognitive skills are ignored. Students good at taking tests might not be good at anything else. Humans are too complex to be reduced to a single number, and such numbers should not be used to make life-changing decisions. Research indicates that IQ tests have limited predictive power. Personality variables like high and stable self-esteem appear to be decisive for life success. SAT and ACT tests are much less predictive of college success than a student’s high school GPA. After many years, the Common Core Standards don’t appear to make students college ready, while motivation, time management skills, and awareness of postsecondary norms and culture do. A look at international tests shows that U.S. students have been bad at test taking for a long time. Such scores would suggest that by now the U.S. would be an economic backwater, but the facts suggest otherwise. It’s possible that countries that obsess about tests more than we do have discouraged the cultivation of creative and entrepreneurial spirits. 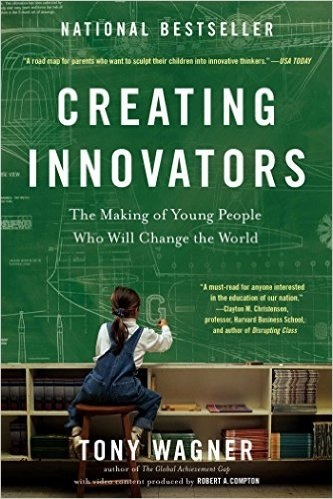 Creating Innovators: The Making of Young People Who Will Change the World by Tony Wagner (© 2012, Scribner: New York, NY) explores what parents, teachers, and employers must do to develop the capacities of young people to become innovators. Tony profiles innovators to identify patterns in their childhood that made them what they are. He shows how to apply his findings to education and tells parents how to compensate for poor schools. Keys include collaboration, interdisciplinary problem-solving, and intrinsic motivation. Sixty original videos are included that you can access via a smartphone. Go to Creating Innovators for a trailer. Innovation is about the process by which new things take place. It involves using novel and creative ways to create value via new products, services, business models, or processes. It involves valuable original ideas or insights that you somehow implement. It’s creative problem solving applied to the real world. Incremental innovation significantly improves products, processes, or services. Disruptive innovations create a new or fundamentally different product or service that disrupts markets and displaces dominant technologies. Innovations can be technical like Apple’s iPod, iPhone, and iPad. They can also be social like the nonviolent strategies of Gandhi and M. L. King. Tony offers the following as the main skills needed: 1) critical thinking and problem solving 2) collaboration across networks and leading by influence 3) agility and adaptability 4) initiative and entrepreneurship 5) accessing and analyzing information 6) effective oral and written communication 7) curiosity and imagination. It is also necessary to imagine the world from multiple perspectives, see all aspects of a problem, be optimistic, experiment to explore problems with a bias towards action, work with others as the day of the lone genius seems to be over. For places like Google and Apple, intellectual curiosity is more important than smarts. They also want people who will take control of a situation rather than waiting to be lead. Creativity is a habit and like any habit, it can be either encouraged or discouraged. Teachers that value the right answer more than provocative questions tend to drum the curiosity out of students early on. Creativity can be encouraged or discouraged. Tony cites work of Teresa Amibile’s who says that creativity or innovation has three components. They are expertise, creative thinking skills, and motivation. She believes that motivation is the most important and that intrinsic motivation has more impact than extrinsic motivation. Tony adds that childhood play should lead to adolescent passion and adult purpose. They are the three interrelated elements of intrinsic motivation. He notes that a disproportionate number of innovative people attended Montessori schools where play is an important part of the curriculum. Knowing how to find those things you are interested in and that motivate you is way more important than specific things you study. This implies that you should put a buffet of opportunities in front of children and let them engage in unstructured play. If a child finds an interest, it should be encouraged. Tony tells of a course at Stanford where students work in teams to solve open-ended problems. Most high school and college courses that feature individual competition, specific content, and extrinsic incentives like grades and GPA. What is needed are courses that feature teamwork, multidisciplinary approaches, and the intrinsic incentives of exploration, empowerment, and play.